Sometimes you have to take it down a notch. As wives and mothers we often find this difficult to do mainly because there is always the next thing lurking about to be done or taken care. We try to maximize very moment we have. I mean after all, if it needs to be done consistently, in a timely manner while being organized, we can do that. Yet, that does not mean that I have not shown up at church with my son in flannel pjs and cowboys boots. Or didn’t have time for makeup and everyone thought a tragedy had happened. And yep, I even had the kids all in the van packed and loaded with a few minutes to spare to stop for gas … well we had to turn around and get my hubby but, I ran an efficient ship! Now the kids are grown with lives of their own and hubby is retired working on a second career. Thank you Father! As wives and mothers, well any woman really. Have you ever considered taking it down a notch just for a little while? We often refer to this as ‘me time’. I think it is great when we schedule this ‘me time’. But the ones I cherish most are the unexpected ‘me times’. I preferred to call them ‘God nuggets’. Simply because only He can work through unplanned inconveniences to give us what we need. Even though many times we don’t realize that we are missing something. I believe that no matter what is going on with me or around me, -God is doing a great work! When a kid or you were under the weather and you had to rearrange your entire week …again to take care of the little one or yourself. Did you view this time as an inconvenience or have a pity party or did you stop and look into littles ones eyes and speak blessings over her and into her life? And when she fell asleep did you bow beside her bedside or the couch and pray a prayer of thanksgiving that out of all the mothers in the world, He Chose You! If you are or have actively been doing this, I thank God or you. This is something I had to learn over the years. I also had to learn to be grateful for the inconvenient moments and some of them were really hard! The death of my daughter was hard but I had grown in my relationship with the Lord and knew I would only need to trust him. I chose to walk with him and boy there were some dark days but He never let go and I held as much as a broken bird could hold. In the middle of the night when everyone was sleeping I would lay wide awake unable to shut my brain off. But gradually these moments of joyous memories would come in. You see I decided that we ‘our family’ would not be the same when we came out on the other side no matter what that looked like. So I try with all my might to live every moment to the full. I quit my job as a paralegal and took my military family everywhere I could. We laughed a lot and we cried when things went from worse to devastating. God had a plan even though we would not like the outcome. Now when we look back and share in those times we are able to see a beautiful portrait of life because we allowed ourselves to see God in the midst of it. Right now, there is a ton of work for me to do at work but I am home nursing a sore throat. Had a doctor’s appointment this morning that shows no strep, flu, cold or sinus infection. Just good old allergies.. I went to work but felt too badly to be productive. So I came home and felt better. With that lil’ bit of energy I started on house chores but then felt the calling of a ‘God nugget’. Yes, my desk at work is overflowing and chores need to be done but, God … the sustainer of all needed a fireside chat. So I stopped every thing, got a blanket and small pillow, took some ibuprofen, made a cup of tea picked up my bible and chatted with an old friend. I am rejuvenated. I am restored. I still have a sore throat but, I am ready to go back on the mission field and serve as wife, mother, daughter, sister and friend. Try it. Just let it go and take it down a notch. I promise you will be so glad you did. Not only am I striving to eat cleaner but I am also trying to learn to live with less. I really try not to run to the store every day but instead to either improvise or do without. One area I am streamlining is cosmetics, beauty supply items and hair stuff. How did I get so much? Well I am so glad you asked ☺️. I stopped getting my hair chemically relaxed four years ago. Turns out the products that I used on my chemically treated hair are not beneficial for my natural hair. I went through a period of making my hair look like other natural hairstyles that I like. While easy to do while my hair was relaxed it, ain’t so when you are learning that hair texture is a huge part of hairstyles! Learning to let my hair form its own natural curl pattern also helped me to realize that the products I was using on my hair could also be used on my skin. Instead of 15 different products I am now down to 5! Coconut oil, Shea butter, olive oil, cocoa butter, and vitamin E are my everyday essentials for hair and skin. 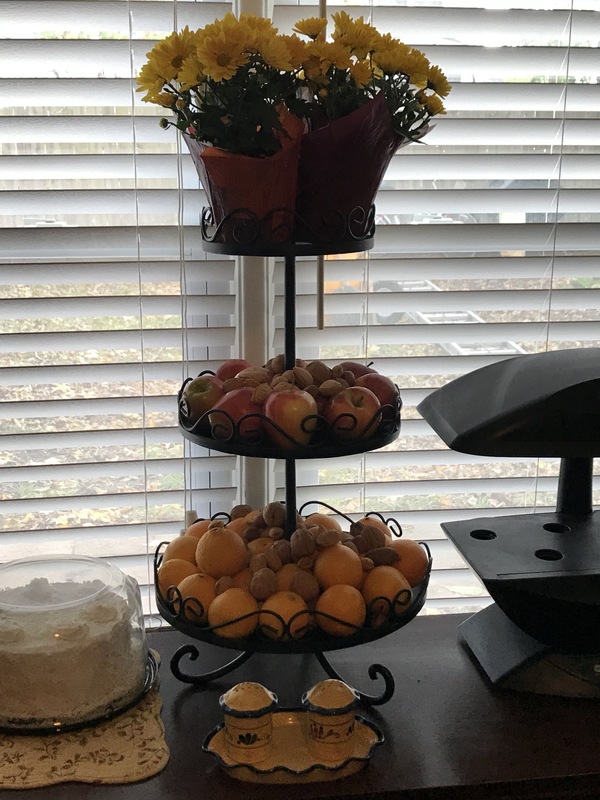 This has proven to be cheaper and a lot less clutter. And not to mention it is easier on the wallet 💰. One morning I was rushing to get ready for work and forgot to put my Shea butter on my face as my skin gets really dry in the cooler months. Being the queen of improvising and being too lazy to go back into the bathroom and put my moisturizer on, I decided to use my chapstick to put on the problem dry areas on my face before applying my makeup. My cheeks and under eye areas are sometimes scary so I applied extra to those. Then I proceeded to apply my make up. I always do my eyebrows first. One eyebrow in and my eyes begin to water and then kinda burn. That is because your majesty did not have her glasses on and failed to realize that she did not have the cherry flavored chap stick but rather the peppermint one! (I promise these things only happen to me!). I am still fascinated at streamlining, decluttering and organizing my life. But sometimes improvising can be amusing and downright funny. Peach butter and strawberry jam. Fruits that were sun kissed and picked by yours truly and made into these delectable treats. I’ve taken an interest in preparing my own foods and eating whole foods. I quickly found that this takes a lot of time and preparation. But you simply cannot beat the flavor. I truly enjoyed getting to slow things down a notch and take charge of what we are eating and choosing where it comes from. Growing up in the Deep South, we had a garden every year! Not just a patch but a HUGE one. Nothing like eating veggies still warm from the sun and sharing with neighbors. Interestingly, this is a lifestyle I promised to walk away from and not look back. Now that I am halfway to being 100 years old, I truly miss it and realize that on many levels, I never left it. To this day, I don’t eat soup from a can🤢 and I have always made my own broths.So this summer I stepped it up a notch on canning. The Jams and Butters turned out fantastic! But mercy me -the pickles were horrible!!! I will have to try that again next year! Another item that came out great was the chow chow! It’s like a pickled cabbage and most southerners eat it with beans and/or greens. You chop fresh cabbage and bell peppers straight from the garden and ladle it with vinegar (this is not the official recipe!) I made jars of chow chow! Since the Jams and Butters made such small amounts, I decided to double the recipe for the Chow Chow and it proved to make a nice bountiful batch! The only problem is… no one in my family likes it and my friends and co-workers have no idea what it is🤣😂🤣. So I’ve got jars of the stuff just sitting in the pantry! Suppose I should have inquired first. But I had a blast canning. Just me, some fruits and veggies and my audiobooks. Euphoria! On any given work day morning will have to go to my car for either my stainless steel travel mug or to put something in the car. On this particular morning, I cannot remember why I was headed to my car (I hear that this comes with age). As I bend down to get into the car something moving quick catches my eye. As I see it the second time I realize that it is a juicy spider!! Surmising that I walked in to the spiders web I do what any graceful woman would do; I flail my arms in wildness trying to get that spider off the front of my shirt. This spider proves to be resilient to frantic flails of the wild woman and this little sucker hangs on for the ride. Just as I am attempting to strip my shirt off, I briefly think … this spider may get caught in my hair and then … I will die! The scene worsens … something is now crawling on my neck. Sheer panic has set in, my ears are hot, my skin is prickly as I reach for my neck hoping this is not another spider. I put my hand under my hair and begin to swipe at the suspect and … all goes still. My heart begins leap for joy as a slow realization come to light. I have my headphones draped across my neck with the buds hanging down. No spider! Just Earphones!! Pure delight and pure laughter. It is wonderful when you can laugh at yourself. The more I realized that there was no spider, the more I was able to see my erratic behavior. But this is a true reflection of my life. I am walking confidently, minding my own business. Things look right and feel right until someone, something shines the light of truth onto the situation or circumstance. Then I can see clearly. I can see what is the truth of the matter. Now , I get to operate in a whole new reality. I get to make choices out of the shed light instead of the darkness. Have you ever been in a situation only to find that you were wrong about something? It was not until the light was shone upon the situation that you were able to see things differently. My reaction to this shed light of earphones was laughter but, sometimes things are just not funny. It does not feel good to be wrong sometimes. But there is NO room for self-hate or negativity. There should only be room for remorse, gratitude, reflection and growth. Just a little lite reading ☺️ Actually I am super curious about our foods, how they have changed in the way they were grown and all the different eating ways and lifestyle and where I am in the mix. Currently I am reviewing Paleo and Nutritarian lifestyles. Out of all that I have read -which will I lean towards or will it be a blend? Atkins, Paleo, Whole 30, Vegan Nutritarian what are they all about? How are they different and how are they alike? One of the hardest things, when mentoring a young person, is to find the right words at the right time. When I know what to say or how to speak to a situation in my mentee’s life, she either does not want to talk about it or does not see it as an issue. However, when there is something amiss and I have nothing encouraging to say or words simply fail me, God never disappoints to show up and guide me and my mentee. As I have said many times before, mentoring is a two-way street. The giving will flow both ways. As you pour into someone’s life the richness will also return to you in unexpected ways. My 11 year old mentee and I were together one evening to bake brownies for my husband and for my colleagues. On the ride from her house to mine, she kept talking about how upset she was that her guardian would not let her do her new chores her way. The guardian insisted that they were done her way and when she told her to them –no negotiations were allowed. Now I have learned not to speak too soon! You may prompt and ask questions but do not venture out too soon on the advice. Even when asked, just don’t do it. Keep the conversation going with open ended questions –why is this so upsetting to you? Why do you think this is so important to your guardian? Do you like the new chores/responsibility? If you were the guardian what would you do differently? We go into the kitchen and get everything we need to make two batches of brownies but my young lady is still chatting away about her circumstances. I decided to let her take her frustrations out on a generic box of brownie mix because I did not want her to mess up my good batches. My go-to stress reliever and thinking job is baking. I gave her box and said “here, go for it however you please”. I drank some hot tea and had a seat while she chatted, and chatted and chatted and finally ready to put her brownies in the oven. Whew!! Now we are finally both calm enough to bake some real brownies. We chose our boxes and got started. I decided we should ‘freestyle’ and embellish them with some Caramel and Reese’s candies. And into the oven the brownies go!! And out comes the ‘anger brownies’. Upon seeing them lil’ Miss Mentee proclaims “those brownies look a hot mess”!! I ask, “why? What is wrong with them?” She said, “I don’t know, I was not paying attention, I mean I know it takes eggs, and milk but I am not sure of the order or amount”. And here it comes! I did not plan it, it just worked out this way. I said when you bake something, you must read the instructions and follow them at least the first time you make the recipe. She interrupts with “but you didn’t follow the instructions”. No dear, I did not because I have made these brownies for years. I can make them with my eyes closed and I know how much and with what I can add to them without resulting in a mess. The same is with your chores. You must do them as instructed initially. Once you have done them and prove to your guardian that you are more than capable of doing them, you may be able to do things differently. But in the beginning it is imperative that you follow instructions or end up with a hot mess! Her simple response was “Oh, I see now. I guess she wins”. Dearest, it is not about winning, I explained. It is about learning to do the right thing, the right way, for the right reason, with the right attitude and at the right time. Your freestyle will come after this. I did not plan or orchestrate this event with this specific illustration in mind. I made the brownie and simply allowed the Holy Spirit to intercede. I learned that it is ok not to be always on guard with the answers but remain yielded and still so that I can hear that still small voice speaking instead of the three people who are always living and chatting in my own head (ha!). Columbine wasn’t the first. Charleston won’t be the last. It’s not a gun problem. It’s not a race problem. It’s not a healthcare problem. We have mass shootings in America because we have an imagination problem. When tragic evil happens, we look for rational explanations that give us a sense of control through understanding. Teenagers go on a rampage in their high school because they had access to firearms. A young white man murders in a black church because he’s a racist. The perpetrators are outcasts, misfits, and castaways that fell through the cracks of a society that is largely insensitive to mental illness. Everyone misses the cues until it is too late. Unarmed witnesses watch helplessly as the murderers unload and reload and unload again. Lions and tigers and Giraffes? 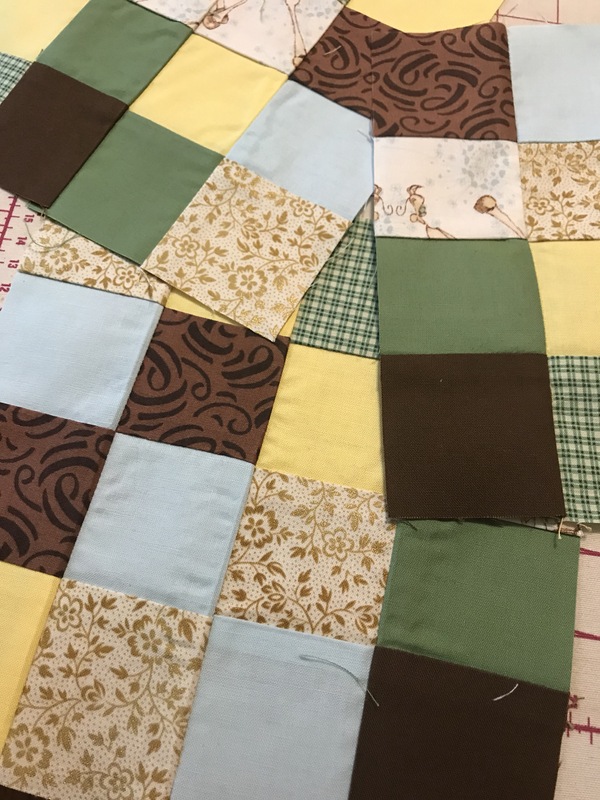 I get orders for baby quilts frequently and I am usually free to just go for what ever creation or design I may come up with. This particular customer asked for a baby quilt that is full-sized and a giraffe print. For about one month, I’ve been researching giraffes and looking for fabrics. Giraffe fabrics are usually accompanied with monkeys or jungle animals. These animals have different habitats but they are plopped together in a rain forest setting. Anyway, the next thing to consider was colors. 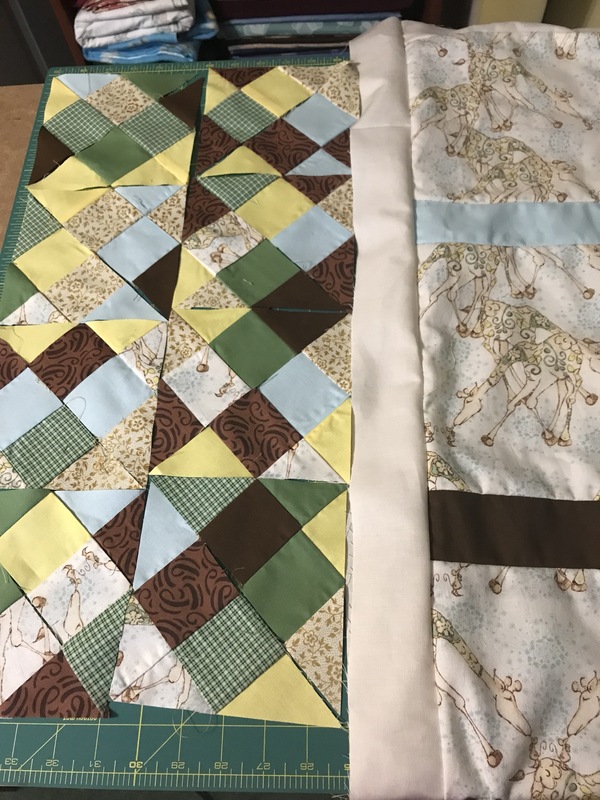 Primary colors were easy to find; then there are some pastel colors and finally plenty of animal prints which is kind of risky for a baby quilt. I solicited the help of the grandmother to go shopping for fabric and to come up with some ideas. Right off the bat grandmother found three adorable fabrics she would like. This is great, but it is the mom who is the actual customer so we need to look and shop with her style and creativity in mind. So we took pictures of all giraffe fabrics we could locate in the store and we sent them to Mom to see which one she would like. Mom quickly reply, all the first one, I love it. We took a picture of that particular fabric as a courtesy and never expecting her to choose it. Nonetheless she did choose it and yes it totally threw my entire creative game plan off track. 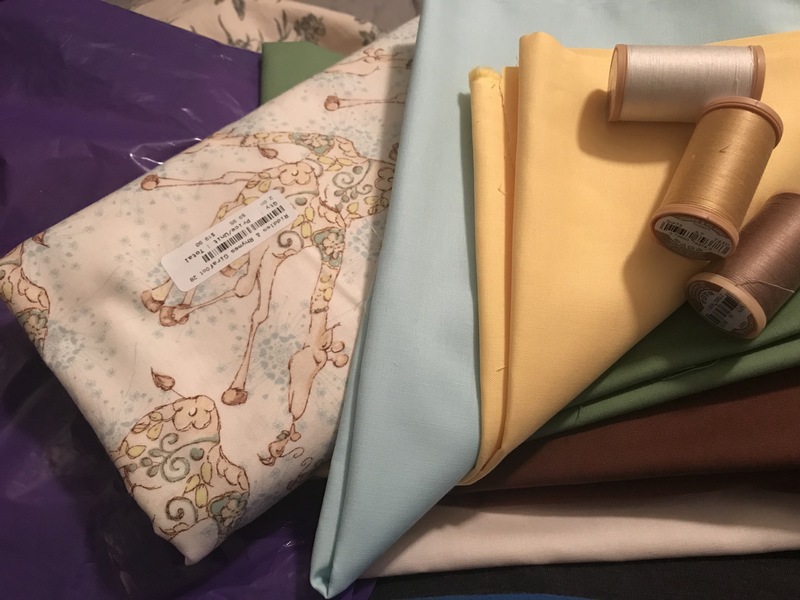 These colors are not in my stash, so I purchased some nice Kona fabrics that were on sale. I always over the quilt size and color scheme before I go search. But on this occasion my mind was on baby quilt size instead full quilt size even though I used all of the fabric it is enough to make the quilt top. Since the fabric is so light in. I thought I would do a patchwork border to brighten up the quilt but still keep the integrity the fabric. 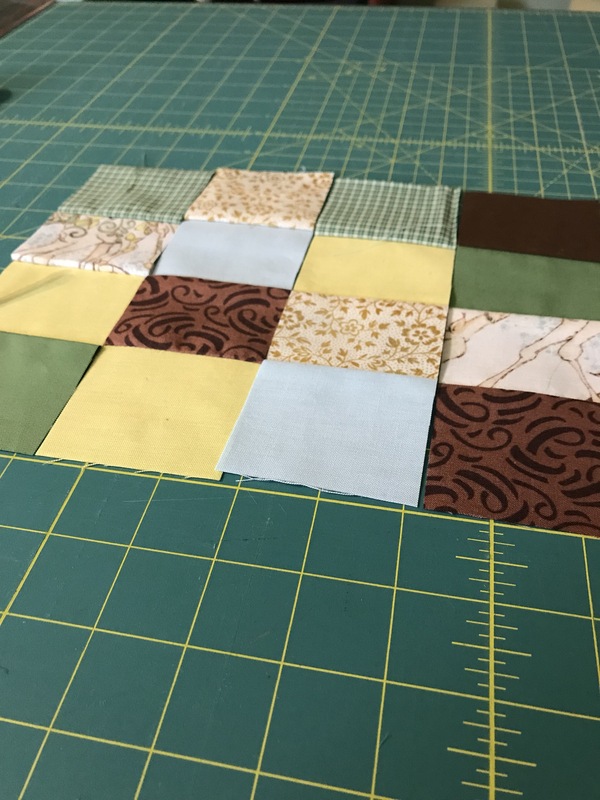 This is my first time trying patchwork. It is coming together beautifully but I do realize the need to be extra careful with the 1/4 inch seam and to be consistent with it. I think I am going to like the way this one will turn out. I hope to finish the border this weekend and find a nice pale yellow flannel backing and perhaps a giraffe patch with the babies name on it. I rarely sign or label my quilts I’m not for sure how I feel about that. But I am told that I should do it so that no one else could claim my work.